Clinical Information: Radiopacity seen in upper left anterior region. Confirmation required of likely diagnosis and relationship with adjacent teeth. Clinical Information: Trauma from fall off bike. Assessment of upper anterior teeth for fractures. 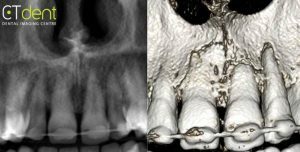 Main Findings: Maxilla: No abnormalities detected Sinuses: A generalised increase in the thickness and density of the tissues lining the right and left maxillary, ethmoid, and sphenoid sinuses were noted. The bone forming the maxillary and sphenoid sinuses is thickened and sclerotic/increased in density. Basic Report for Pathology only. 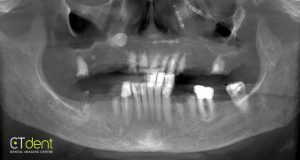 Clinical Information: Implant analysis requested. Relevant History: pre implant placement and bone levels LLQ.